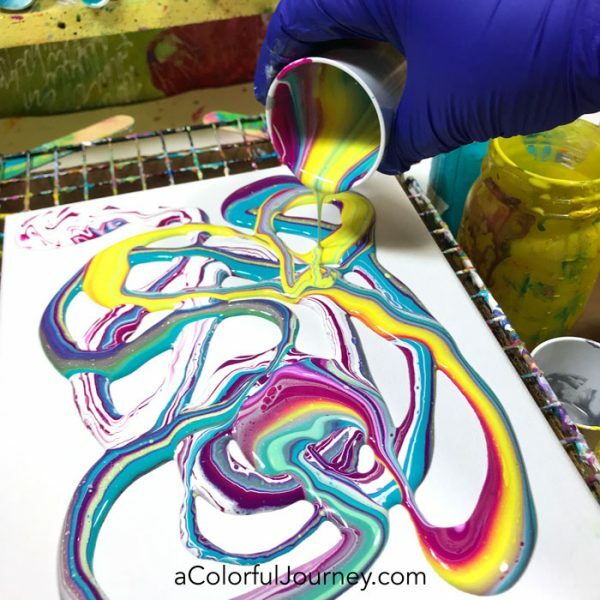 Do you love watching the videos on paint pouring, but really don’t know where to begin? How much paint to use? What kind of paint to use? Ratios and amounts? Color combinations? 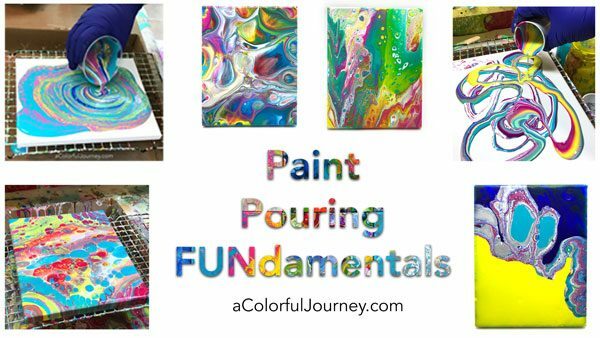 You’ll get all of these answers and more in Paint Pouring FUNdamentals, an online workshop. 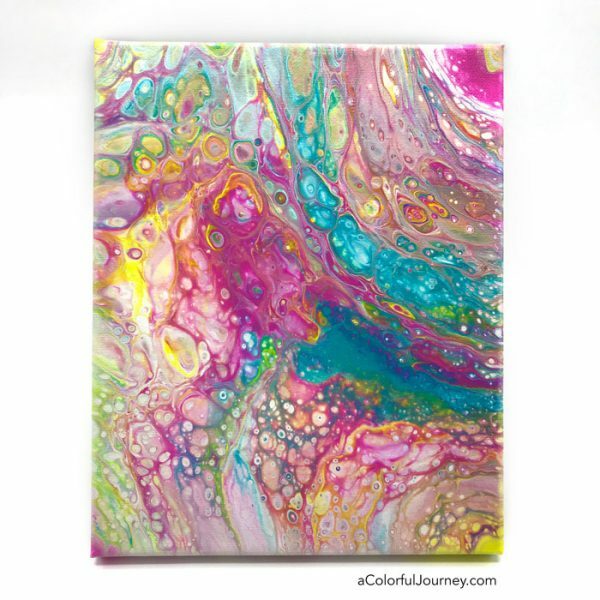 Does paint pouring seem like a big mystery? It’s actually simple when you understand why the paint is doing what it’s doing. I’ve carefully chosen the techniques in this workshop so you have a strong understanding of the FUNdamentals step-by-step. Having the solid foundation means you can easily apply the knowledge as you are making your pours. 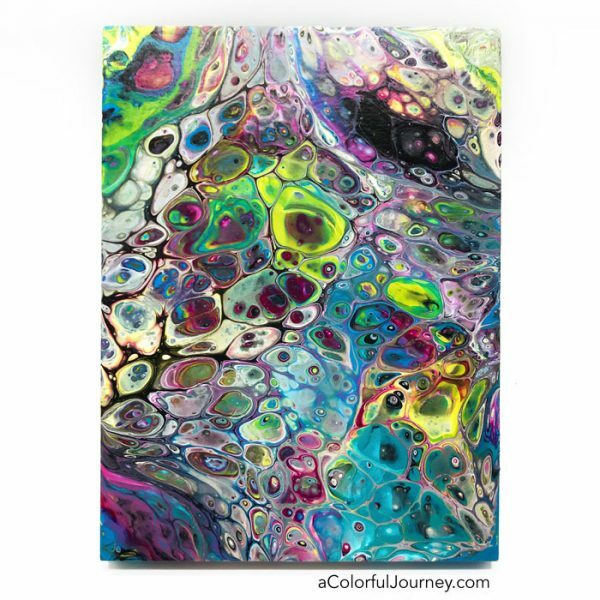 Lessons like The Slinky effect, Topographical Pours, Currents and Riptides, and Saltwater Taffy demystify paint pouring for you so you have a strong FUNdamental understanding of why your paint does what it does. How do I know all this about paint pouring? Trial and error. Practice. 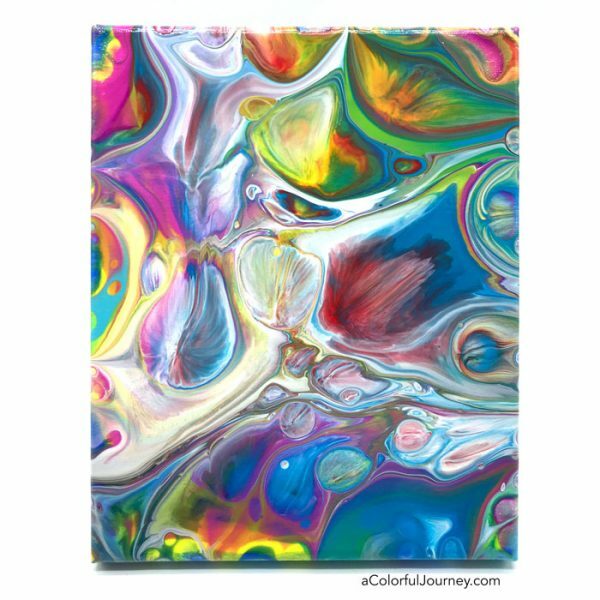 Over 500 canvases and my obsession to understand why the paint behaved the way it did. Since I understand why it’s happening, I can break it down step by step for you. 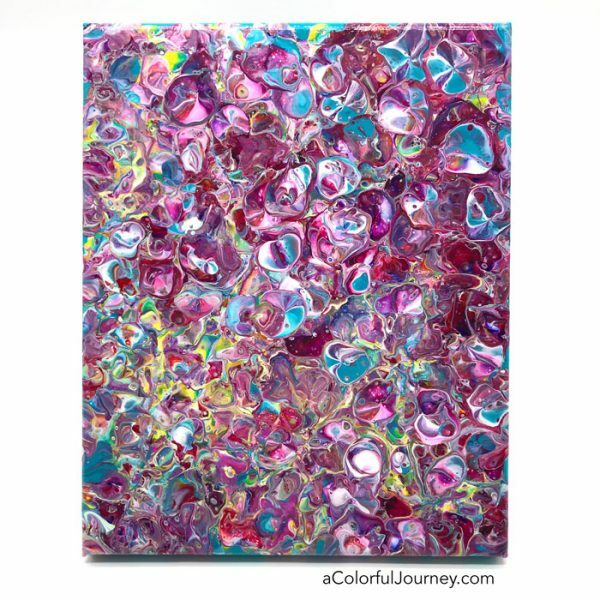 All the things I wish I had known when I started, I’ve put into this workshop so you can skip all that and get right to making canvases that make your heart happy! Uncomfortable just eyeballing your paint and pouring mediums? What if you had another way that let you create the ratio of paint to pouring medium you needed every time? And without any measuring? Using any brand of paint? That’s in the getting started section of the workshop. When you add the colors of paint into a cup, does it matter what order you put them in?Yes, but 2 things matter far more than that. You’ll see what these subtle things are that make a huge impact on the pour as we do a side-by-side comparison in the Cannonballs of Color lesson. Intentional, controlled pours? Is it possible? Absolutely! In the Very Hungry Caterpillar, Building an Intentional Composition, and Pouring with a Point lessons you’ll see how. What about the ugly ones? Not every pour is magical. What can you do about it? I’m sharing my go-to way to save a pour in the Rescuing an Ugly Pour lesson. What’s included in the workshop? 15 lessons, lifetime access, videos you can download or stream on mobile or desktop, plus 5 bonuses! AND a 30 day money back guarantee! This is a self paced workshop so all lessons are available as soon as you’re registered. Have a frugal side that is as tight as the bark on a tree that thinks about the wasted paint? There doesn’t have to be any wasted paint. The paint that drips over the edges, that gets used. You’ll see how in the Sunny Side Up Eggs lesson. There are lessons that have almost zero paint going over the edges. The canvas below, with all that pattern, had only a few drops of paint go over the side! Are all the supplies intimidating? They don’t have to be. The getting started videos in the classroom right now clearly explain the pros and cons of the materials so you can use the ones that are right for you. You’ll get the easy, no fail way to mix paint and pouring medium as you’re diving in to making a pour. That’s just the pre workshop getting started section. How many supplies do you have to have? 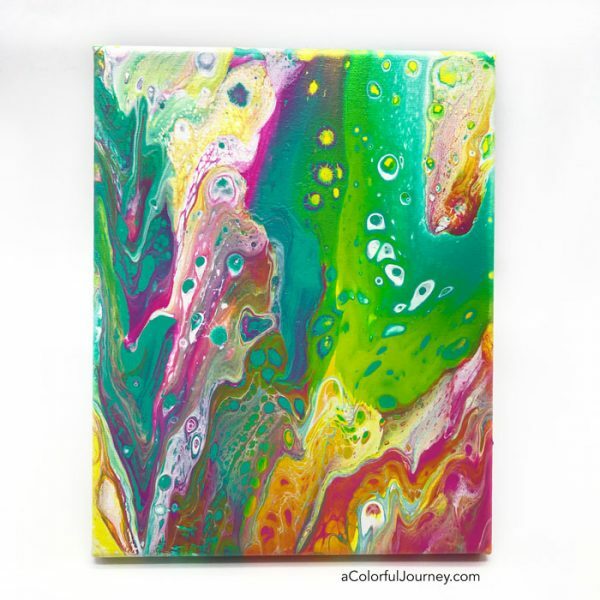 Here’s the basics of what you need: 3 colors + white of acrylic paint, a pouring medium (the least expensive is Floetrol from the hardware store), a canvas, something to mix the paint in, popsicles sticks, a box to catch the drips and plastic cups. Oh and gloves. You’ll definitely want gloves. 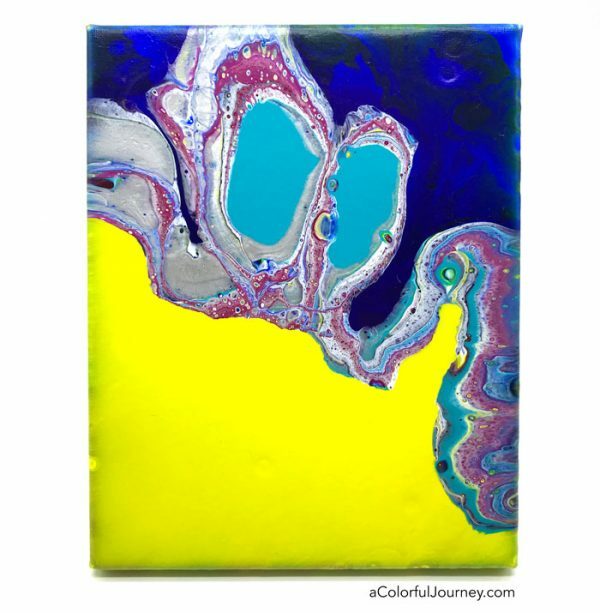 In the workshop, you’ll see what different pouring mediums do. I’ll be using 3 different pouring mediums because each one does something a little different. The key is finding which pouring medium gives you the look you want. Want a glass like finish? Want a ton of cells? Want incredibly crisp lines and details? And you’ll know which one will give you the results you want when you understand the FUNdamentals. What does the oil really do and why? The getting started videos in the classroom walks you through setting up your space and introduces you to the supplies. 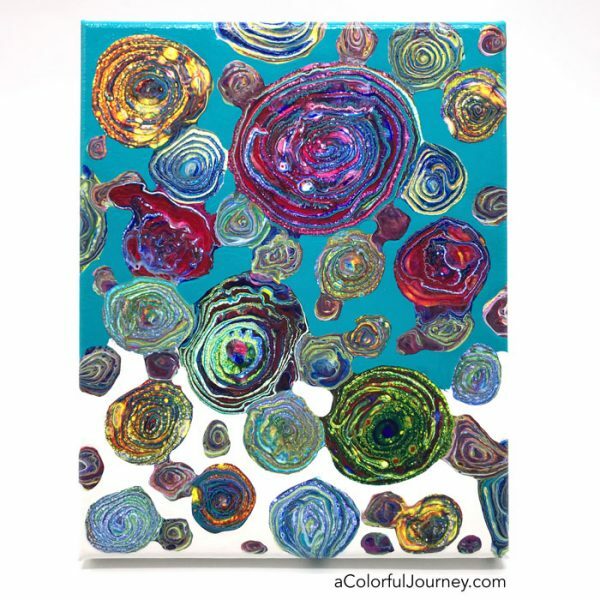 Will I learn every possible way to do a poured painting in this workshop? Every single possible way would make this a multi year course. Instead of showing you every possible way, I’m showing you the types of pours that illustrate the principles of pouring. That way you have a strong foundational understanding of why and how paint pouring works. This enables you to understand the forces at work no matter what technique you use. 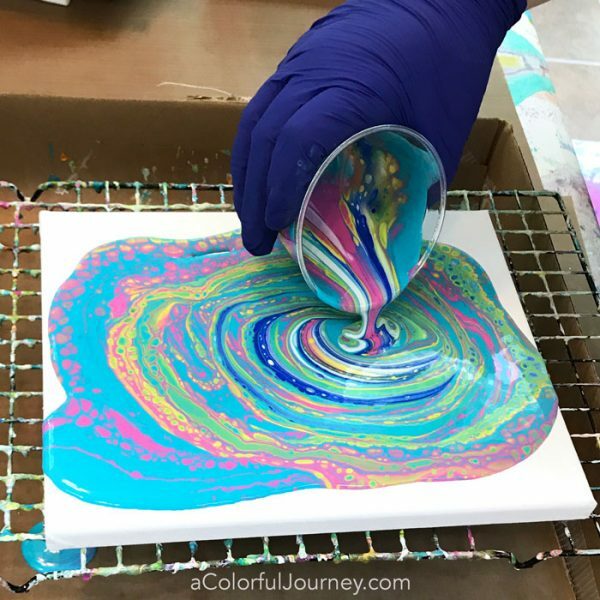 I have never done paint pouring- will I be able to do this? Yes! No experience needed. Do I need special paint? Nope. Acrylic paints, any brand. Craft paint or artist grade paint all work well for pouring. In the getting started section I show you an assortment of paints so you can pick and choose what is right for you. Do I have to use a pouring medium? Yes, you’ll need a pouring medium. Any brand or kind of pouring medium will work. Are you using a torch? No. I will not be using a torch in this workshop. I just don’t trust myself with fire. How long are the lessons? The lesson videos are approx 15-25 minutes. I’ve edited them carefully so that they are direct and to the point. How long will I have access to the workshop? Lifetime. Once you’re a member, you’ve got unlimited access to the classroom and videos. Can I watch the videos on mobile devices? Yes. The videos are hosted on Vimeo and they have an app. Are the videos downloadable? Yes! Is there a money back guarantee? Absolutely! Check out all the videos, the content and if what you’ve learned hasn’t helped you simply send me a one line email letting me know the workshop isn’t right for you for any reason within 30 days of purchase and you’ll get a prompt 100% refund. Are all the lessons available now? Yes, this is a self paced workshop, so all the lessons are waiting for you right now. Where can I get the supplies? One of the pouring mediums, Floetrol, is found in large hardware stores. The other supplies are from arts/crafts stores like AC Moore or Michaels. In the classroom, I’ll have links to each product for those who prefer to shop online. I don’t have a lot of space. Will I be able to do paint pouring? Yes. If you have a couple of feet on a counter you’ll have plenty. I’m making all 8×10 size canvases. Why not any larger ones? Because that is what fits on my counter where the video camera is so that you get a birds eye view of the entire process. What if I have questions as I’m pouring? Then just ask and I’ll answer. Sometimes just getting a straight answer to a small question is all you need to get over a hurdle. You can ask questions on the lesson pages and in the optional secret Facebook group.